Greek tragedy is a form of theatre from Ancient Greece and Asia Minor. It reached its most significant form in Athens in the 5th century BC, the works of which are sometimes called Attic tragedy. 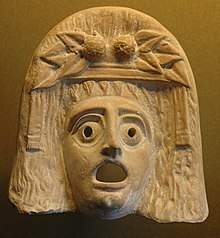 Greek tragedy is widely believed to be an extension of the ancient rites carried out in honor of Dionysus, and it heavily influenced the theatre of Ancient Rome and the Renaissance. Tragic plots were most often based upon myths from the oral traditions of archaic epics. In tragic theatre, however, these narratives were presented by actors. 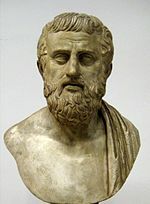 The most acclaimed Greek tragedians are Aeschylus, Sophocles and Euripides. According to Aristotle, tragedy evolved from the satyr dithyramb, an Ancient Greek hymn, which was sung along with dancing in honor of Dionysus. The term τραγῳδία, derived from τράγος "goat" and ᾠδή "song", means "song of the goats," referring to the chorus of satyrs. Others suggest that the term came into being when the legendary Thespis (the root for the English word thespian) competed in the first tragic competition for the prize of a goat (hence tragedy). The poet, who first tried his skill in tragic verse for the paltry prize of a goat, soon after exposed to view wild satyrs naked, and attempted raillery with severity, still preserving the gravity of tragedy. —  Horace, Ars Poetica 220 (Smart & Buckley translation). The structure of Greek tragedy is characterized by a set of conventions. The tragedy usually begins with a prologue, (from pro and logos, "preliminary speech") in which one or more characters introduce the drama and explain the background of the ensuing story. The prologue is followed by the parodos (entry of the characters/group) (πάροδος), after which the story unfolds through three or more episodes (ἐπεισόδια, epeisodia). The episodes are interspersed by stasima (στάσιμoν, stasimon), choral interludes explaining or commenting on the situation developing in the play. The tragedy ends with the exodus (ἔξοδος), concluding the story. Some plays do not adhere to this conventional structure. Aeschylus' "The Persians" and "Seven Against Thebes" for example, have no prologue. Greek tragedy as we understand it today, was not merely a show, but rather a collective ritual of the polis. [note 3] It took place in a sacred, consecrated space (the altar of the god stood at the center of the theatre). During the Dionysia a contest took place between three plays, chosen by the archon eponymous. This procedure might have been based on a provisional script, each of which had to submit a tetralogy consisting of three tragedies and a satyr play. Each tetralogy was recited in one day, so that the recitation of tragedies lasted three days. The fourth day was dedicated to the staging of five comedies. [note 5] At the end of these three days a jury of ten people chosen by lot from the body of citizens chose the best choir, best actor and best author. At the end of the performances, the judges placed a tablet inscribed with the name of their choice inside an urn, after which five tablets were randomly selected. The person who received the highest number of votes won. The winning author, actor and choir were thus selected not purely by lot, but chance did play a part. ^ Some discussion exists on the function of satyr plays, however. See: Griffith (2002). ^ An exception is Prometheus Bound, in which Zeus strikes tyrannical attitudes. ^ Paul Judges Emilio assumed that it was for this reason that the construction of the theatre needed a certain size to hold all the free citizens of Athens. See his History of Theatre in Italy p. 18. ^ The Dionysia was also called Great Dionysia, to distinguish them from rural areas, plays a minor that took place in winter in countries around Athens. ^ During the Peloponnesian War the number of comedies was reduced to three, to be performed once a day, at the end of the tetralogies. It has been argued, the Athenians took this decision due to their financial situation at the time. 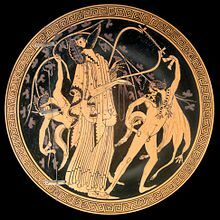 ^ The presence of attacks on Zeus casts doubt onto the authorship of Aeschylus's Prometheus Bound. ^ Some scholars equate the two sources, assuming an error of Aristophanes, of 17 instead of 7. Cf. Rossi & Nicolai 2006, p 93. ^ Hart, M.L. (2010) The art of ancient Greek theatre (Los Angeles: Getty Publications). p. 9. ^ Winkler, J.J. & Zeitlin, F. (eds.) (1992) Nothing to Do With Dionysus? : Athenian Drama in Its Social Context (Princeton: Princeton University Press) p. 60. ^ D'Amico, S. (1960) Storia del Teatro drammatico, parte I: Grecia e Roma (Milan: Garzanti). ^ Harrison, J.E. (1922) Prolegomena to the Study of Greek Religion (Princeton: Princeton University Press). p. 420. ^ a b c d Scodel, R. (2011) An Introduction to Greek Tragedy (Cambridge, Cambridge University Press). p. 33. ^ Easterling e.a. (1989) 1-6. ^ a b Aristotle, Poetics, 1449a. ^ Suda "Arion" (α.3886 Adler); Joannes Diaconus Commentaria in Hermogenem ed. H. Rabe Rheinisches Museum 63 (1908) 150. ^ a b Harvey (1955); Easterling e.a. (1989) 4. ^ Easterling (1989) 2; Sinisi & Innamorati (2003) 3. Cf. Horace Ars Poetica 275ff. ^ Easterling e.a. (1989) 3, 5. ^ Easterling e.a. (1989) 5f. ^ For Aeschylus' innovation of Tragedy, see: Easterling (1989) 29–42. ^ Plutarch Life of Cimon 8.7f. ^ For Sophoclean theatrical inventions, see: Easterling (1989) 43-63; Sinisi & Innamorati (2003) 3. ^ For the character of Euripidean Tragedy, see: Easterling (1989) 64-86. ^ Michelini, A.N. (2006) Euripides and the Tragic Tradition (Madison: University of Wisconsin Press) ISBN 0299107647. ^ For a detailed study of the metric, see: Brunet (1997) 140–146. ^ Aristotle Poetics 1449b 24-28. ^ a b For a discussion of different views on katharsis, see: Lear (1992). ^ Gregory 2005, p. 405. ^ Oates, W. & O'Neil, E. (1938) The Complete Greek Drama (New York: Random House). p. 14-17. ^ Sinisi & Innamorati (2003) 3. ^ Gregory 2005, p. 5. ^ a b Gregory 2005, p. 8. ^ Plutarch Life of Pericles 9.1. ^ According to the Byzantine lexicon Suda, Aeschylus wrote ninety plays. See: Suda "Aeschylus" (αι.357 Adler). ^ Rossi & Nicolai 2006, p. 27-28. ^ Suda "Sophocles" (σ.815 Adler). ^ Privitera & Pretagostini (2006) 276. ^ Suda "Euripides" (ε.3695 Adler). ^ Rossi & Nicolai 2006, p. 184. Gregory, J. (2005). A Companion to Greek Tragedy. Oxford: Blackwell Publishing. Rossi, L.E. ; Nicolai, R. (2006). Corso integrato di letteratura greca. L'età classica. Grassina: Le Monnier. ISBN 978-88-00-20328-9.